Have you known a revolutionized system that gives drone cargo system? This is about it. SKYFchain is the first B2R (Business-to-Robots) blockchain based operating platform. This private blockchain system provides independent secure data-exchange and payment channels for a total support of robot — centric logistics. The SKYFChain Operating Platform will based on private blockhain. It will use ERC20 compatible protocol for SKYFT tokens and build payment channels for exchange transactions. SKYFchain is unique because it will be designed to exclude the human as an intermediary and it will have access to confirmed clients of the first industrial heavy duty cargo drone — the SKYF drone, which is already flying. Technically, the main purpose of the SKYFchain is to integrate critical information for all market participants and organize execution of smart-contracts for transactions. 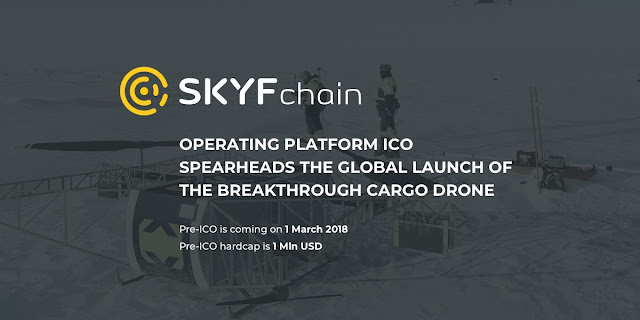 SKYFchain aims to create the whole new industry of airborne cargo drones and later invite groundborne and sea-borne cargo robots for the new business opportunities. SKYFchain is an open blockchain platform for keeping records of all the key events occurring with cargo robots and their interactions in the supply chain. Each transaction is recorded on the platform. Each record has an own cost depending on the type, frequency and complexity of transactions and is denominated in a traditional currency. All calculations within SKYFchain will be processed in SKYFT tokens, as required by the smart contract logic. Since the number of participants and the number of transactions in the platform will constantly be increasing, while the number of the tokens is fixed, the cost of the SKYFT token will be increasing as well. SKYFT tokens will be freely quoted on the main cryptocurrency exchanges. Next to that, the SKYFT tokens holders will receive their share of the cost of every transaction made within the SKYFchain platform. Traditional cargo logistics is one of the most complex industries. It is extremely dependent on the human factor; a lot of manual labor is used in the transportation process. In order to continue their expansion, companies will have to change the freight industry itself. Further optimization of the market of traditional logistics is simply impossible. Most of the proposed iterations make it possible to reduce only tenths, and sometimes even hundredths of percent of costs, or barely slightly reduce the time spent on delivery. The future of the industry is unmanned cargo logistics. Such market giants as Google and Amazon have already begun to test using UAVs for small parcels delivery, and UGVs for the service of the warehouse complexes. The actual system is not transparent enough. It includes dozens of mediators, and the number of their interactions with each other within a delivery can sometimes exceed a hundred or even a few hundreds. Blockchain can help solving this problem. The technology will naturally fit into the logistics market and will make it more efficient in the very near future. Furthermore, blockchain is necessary for the full implementation of unmanned delivery, whether it is to be done by drones or car wagons. “It is SKYFchain that can unite all the market participants as based on the same distribution system. This will remove a lot of problems, starting with the approval of the delivery route for robots and ending with the calculation of insurance fees and payment transfers. Not only will this approach reduce transaction costs, increase the transparency of logistics schemes and calculations, but it will also increase the speed and quality of cargo delivery. The transition of logistics to the unmanned systems (rather ground than aviation) is a matter of a very short time. SKYFchain is the only solution able to satisfy all market participants. With the help of SKYFchain, we will support the logistics industry transition to the unmanned systems, which will result in a significant reduction of the transportation costs. All consumers will benefit from this, but especially those who are located in the least developed regions, in terms of logistics and all. SKYF is the world’s first industrial grade heavy cargo drone. We partner with our current clients in oil&gas, agriculture and logistics to make SKYFchain reliable and easy to integrate into today’s supply-chain. 20% of revenue for the first 1000 drones sold will be used to buy back SKYFT tokens (the equivalent of $50–70M) and fund the development of the SKYFchain Operating Platform. SKYFchain has exclusive rights for mission planning, verification and operations support of SKYF drones and all. This project named SKYFchain. SKYFchain is the first blockchain based B2R (Business-to-Robots) Operating Platform SKYFT is an internal currency of the SKYFchain Operating System. Operational fintech platform SKYFchain ensures development of the robotized air, sea and land delivery market as well as set the new standard in the financing, manufacturing, servicing and insuring cargo robots and all. The platform is built upon a powerful unmanned aerial vehicle SKYF Unmanned Aerial Carrier that will be able to deliver packagesover long distances. The multi-rotor, autonomous drone, called SKYF, was designed with logistics and agribusinesses companies in mind to create a air freight platform to help business carry out tasks. The vertical take-off and landing drone has applications in areas such as the aerial application of pesticides and fertilizers, seed planting for forest restoration and emergency situations for food and medicine delivery. SKYFChain issue the fixed amount of SKYFT tokens, which will be required for any transaction inside the SKYFchain. A user requests a transaction in SKYFchain and pays securely in fiat money through his smart contract. SKYFchain aquires SKYFT tokens at a crypto exchange to execute the transaction. SKYFT tokens will be required for any transaction inside SKYFchain. A user requests a transaction in SKYFchain and pays securely in fiat money through his smart contract. SKYFchain acquires SKYFT tokens at a crypto exchange to execute the transaction. Transactions will grow exponentially because robots need to talk with clients. More and more companies, clients, financial instituions adopt the use of SKYFchain, the amount of transactions on the SKYFchain will increase and so will the demand. It’s your judgement to whether or not there will be an increase of usage in this field. For every SKYFchain transaction whether it’s getting loan to buy unmanned vehicle, client payment or something else SKYFchain will charge some commission. 25%of commissions will go to SKYFT holders. For those in the US that couldn’t invest in other ICOs that prohibited US residents, SKYFT tokens are compliant with SEC of USA and available for US investors. 20% of revenues from the sale of SKYF drones will be used to purchase around $50 million SKYFT tokens in the next 3–5 years.